When you need personal nautical gift ideas for the boating enthusiasts on your shopping list, personalized boating products are your best bet. Since their introduction earlier this year, no product has been more popular at BoatNameGear than these personalized fleece blankets. At under $40, including personalized text and stock embroidered image, these blankets are perfect for storing on the boat for cool nights on the water, or for keeping on the couch. Keep your expensive hardcover books and vulnerable softcovers safe from water, sand and sun - on the boat, at the beach or by the pool. This sailcloth book cover has interior elastic straps that slide over the front and back covers of the book. You can read without taking the book out of the cover, or simply use the cover for protective storage. When not in use, just zip closed all the way around the book and carry with the convenient handle along the binding. Set it down on wet sand or boat cushions, pack it in the beach bag with the wet towels - no more wrinkled pages and ruined covers. Best of all, we can embroider your boat name (or any text) in block or script font and your choice of color. 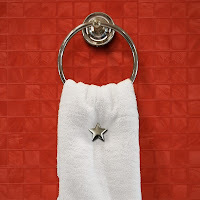 Then they'll love these functional and elegant ToweLoc towel pins, designed to look great while keeping your hand towels from falling on the floor - how perfect is that for a bathroom on a boat?! These ToweLocs are sold by the pair, come in your choice of several nautical designs, and are a perfect complement to BoatNameGear's embroidered hand towels. 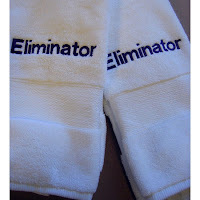 These hand towels are big at 16 inches wide by 30 inches long; perfect for hanging in the head or the galley of any yacht or cruiser. Available in four nautical colors with several options for the lettering color of the boat name.